I can’t help but think of my Nan when the leaves begin to change. I wasn’t a school bus frequenter. After elementary school, I pretty much required carpool or parental pick-ups for survival. So some afternoons, Nan would pick me up. She would typically point out the vibrant fall colors and say how God must have enjoyed painting the landscapes. I was her captive audience as the typical 20 minute commute home from school was extended to at least an hour, since she didn’t believe in making left turns. To her, three or four or ten rights made a left. I remember begging her to a shorter route, but she was as set on not turning left as I was on not riding Bus #928. I know I’ve joked previously about this very important election, but I can’t help but wonder about the events that led to this point. I don’t know many people that are overly excited about our options for president. What dominoes fell for us to be in this mess? Rather, what decisions did we make as a country—which paths did we choose—for us to end up here? To say that we have no control is wrong. No movement—stalling and procrastination—is as dangerous as a wrong or undiscerned decision. We must carefully guard what messages we project to the world, and use our platforms for the good of man verses the good of self. Don’t agree with Target’s stance on gender and their dressing rooms? Stop shopping there. Unhappy about what your kid is learning in school? Run for school board. Tired of bums lining the streets begging for food? Invite them to join you for supper at your local Chic-Fil-A. What about the right choices for the wrong reasons? Here’s where I’m most guilty. I have volunteered to gain favor with an employer. I’ve taken cookies to the new neighbors to see what kind of crazy may have just moved in. And I’ve given out of my excess verses out of my poverty (Mark 12:44). I’ve loved the lovables…but I am/we are called to love those who are less than worthy of our love (Matthew 5:46, Luke 6:27). Sometimes we use our reason to decide the best course of action. Eve did this, and well, she gets a bad rap for deciding based upon her measuring stick what was permissible. The apple looked pretty good to eat, right?…. Even though God said no, Eve reasoned it was probably okay according to her circumstance. We know how the story ends (If not, check out Genesis 3). Experience can be good teacher—like how Nan is now (overly) cautious turning after a fender bender. But even our experiences, those things we have felt, tasted, seen, and explored are limited (1 Corinthians 13:12). God’s Word, the Bible, is the ultimate reference far and above all guidebooks leading to our final destination. We as Christians cannot compartmentalize our faith. Proper discernment comes from reading the Bible and intentional prayer. Then we may best know how to vote… how to tweet… how to love our neighbors… how to serve the one true God. 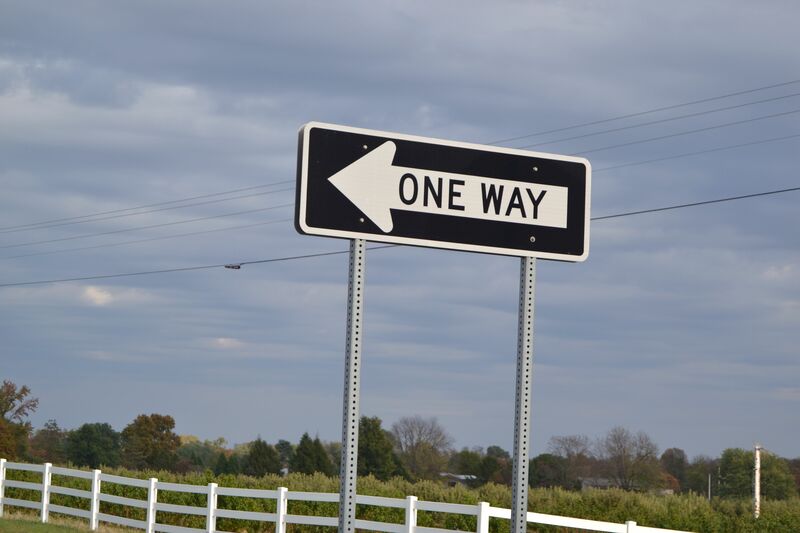 There is only one way. In this bumpy life journey I’ve been completely lost, but now I’m found. Thanks be to God for His redeeming grace makes amends for all of my wrong turns. Posted in Christian Living•Tagged Election Day•by Neena•1 Comment on Left or Right?